Snutki , also known as Polish eyelet or spider web embroidery (see the sidebar below), is a very delicate form of cutwork embroidery. The steps are basically the same as those used by the Polish embroiderers who developed the technique: After transferring the design to fabric, webs are created to connect motifs, running stitches are worked to strengthen the edges and the webs, and buttonhole stitches are worked to enclose the webs. 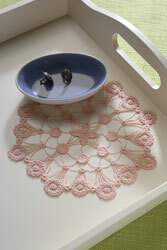 Once the stitched design is carefully cut out, the result is a delicate lacy doily. Apricot Ambience, Peta McMillan’s snutki doily. Photographs by Joe Coca. Materials are available at needlework and fabric stores or from mail-order or online resources. Notes: Use one strand of thread throughout. The shaded areas on the pattern denote the areas where the fabric is left uncut. The connecting webs are made of long, straight stitches. Use a waste-knot to begin threads. Use pearl cotton when working the webs and the floss for all other stitches. Transfer the pattern to the center of the fabric using a pencil and a light source. Mount the fabric in the embroidery hoop. Referring to the pattern, lay the spider web lines (marked in gray on the pattern): Take a small stitch in the ground fabric at the end of each line to secure; use small running stitches to travel along the lines of the pattern to move from one web line to the next. Work all black lines on the pattern using running stitches. To connect from one eyelet to another, refer to Figure 1 (blue is the first journey; red is the second). Starting with a single eyelet (one that does not connect to other eyelets and connects only to webs), use the stiletto to make a small hole in the center of the eyelet. Repeat for the remaining single eyelets. Cover the running-stitch outline of the holes with buttonhole stitches, starting as follows: Make a loop with the thread and thread the needle with the two cut ends; begin the buttonhole stitch by passing the needle down through the center of the hole and up at the outside edge of an eyelet; pass the needle through the loop, making the first stitch. Continue making small holes in the center of the remaining eyelets, starting the buttonhole stitches in the same m ann er as above. See Figure 2 for direction of stitching: Work the inner half of an eyelet, take the needle across to the next eyelet, and stitch half way around it; proceed until all the inner halves of the eyelets are complete. Referring to Figure 3, complete the eyelets; when moving from one eyelet to the next, take the needle down through the center of the incomplete eyelet, then up through the first buttonhole stitch of the completed eyelet marked with a dot on Figure 3. Work buttonhole stitches around the flower petals and the eight large circles surrounding the flower. When all stitching is complete, remove the fabric from the hoop and wash it gently. Remount the fabric in the hoop (do not over tighten), spray lightly with starch, and let dry. Carefully cut and remove the ground fabric between the webs (do not cut and remove the fabric shown in the shaded areas on the pattern); work in small sections from the inside out. Do not cut the fabric along the outermost edge of the design. Restarch the piece, let it dry, remove the fabric from the hoop, and press between two press cloths. Cut away the remaining fabric along the outer edges. Snutki: Lacy Embroidery from PolandThe Polish embroidery technique known as snutki likely developed in the eighteenth century in and around the city of Poznan in west Poland as an imitation of the costly Italian laces available at that time. This delicate form of cutwork, also called Polish spider web or eyelet embroidery, traditionally was worked on finely woven white cotton or linen fabric with white cotton thread, and the designs came from nature.Snutki decorated bonnets, collars, sleeves, aprons, pillowcases, table linen, and linen for churches. Young unmarried women in the villages supplemented their income by accepting commissions for snutki-embellished items from wealthy women. Many women worked on snutki pieces for churches with the hopes that they would be blessed in return for their labor . The technique for working snutki has changed very little over the years. Today, however, unlike the traditional work, a broad color palette offers needleworkers many choices. Whether white-on-white or colorful , snutki produces a lovely lacy effect. Kozaczka, Grazyna J. Old World Stitchery for Today. Iola , Wisconsin : KP Books, 1987. Out of print. Peta McMillan, who lives in Whakatane, New Zealand, learned the basics of embroidery and sewing from her mother and grandmother. She exhibits her work internationally, is active in her local embroiderers’ guild, and teaches various embroidery techniques, including snutki. Visit her website, www.snutki-embroidery.gen.nz.